Full Professor Hugues Boisvert (Accounting) launched two new books with Éditions JFD in April: Analyse comparative – Atteindre les objectifs de performance et relever les défis sociaux, and Gouvernance et financement de l’université, co-authored with Marie-Andrée Caron (ESG-UQÀM). Here are some highlights, below. Intended primarily for directors of finance and controllers interested in assessing and improving their practices, this book contains a set of self-diagnostic tools for management controls, to allow comparisons with best practices in the field. These practices are drawn from analyses of a wide variety of cases, papers and benchmarking projects, many of them published by the author. In this book, Professor Boisvert reflects on the governance and financing of Quebec universities, based on his expertise in management controls. He examines their performance and notes a three-fold responsibility, in teaching and research, and as economic and social players. This role plays out at two levels: in the government department responsible and in the universities themselves. The book suggests major changes to the mechanisms that drive these two entities. Professor Boisvert, FCPA, FCMA, has a PhD in Engineering Economic Systems and a Master’s in Operations Research from Stanford University, in California, and an undergraduate degree in commerce (Management Sciences) from HEC Montréal. He has been with the School since June 1976. He took one year off in 1985 to launch Les Entreprises M.B.H. inc. and the Val Saint-Côme ski centre. His specialties are accounting by activities, management controls, management by activities and benchmarking. He has written several publications and is very active professionally, in particular with the Chartered Professional Accountants of Canada (CPA Canada). 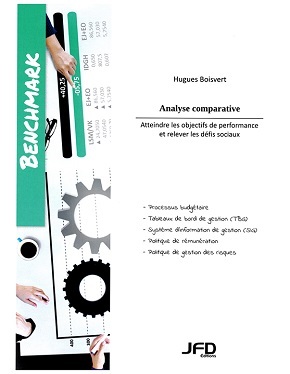 Analyse comparative – Atteindre les objectifs de performance et relever les défis sociaux, by Hugues Boisvert, Éditions JFD, April 2016, 76 pages. 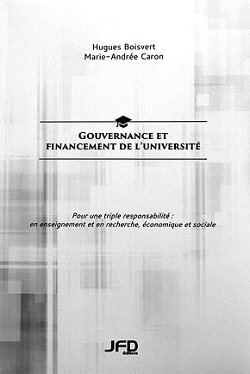 Gouvernance et financement de l’université, by Hugues Boisvert and Marie-Andrée Caron, Éditions JFD, April 2016, 171 pages. Available at the Coop HEC Montréal.